Home > Heavy Duty V Belts > Poly-V Ribbed (Micro -V) Belts > J, PJ Section Poly-V (Micro V) Belts - 3/32" Rib Width. 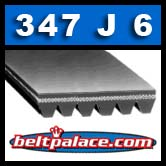 > 347J6 Poly-V Belt. OBSOLETE JAN 2015. 347J6 Poly-V Belt. OBSOLETE JAN 2015. 347J6 Poly-V Belt. 34.7 inch 6 rib Belt. PJ881 Metric Length: 881mm. OBSOLETE JAN 2015. THIS ITEM IS NO LONGER IN PRODUCTION FROM ANY SOURCE WE KNOW OF. You will have to modify your machine to fit 340J6 or 350J6 belts. Now would be a good time to shop for a new snow blower... Sorry!! !